I’m gay.” When a child confides these words to a parent, they can totally transform the relationship. Whether that results in a closer bond or a broken one is dependent upon the parent's ability to accept, nurture and honor the child, whatever his or her sexual orientation. 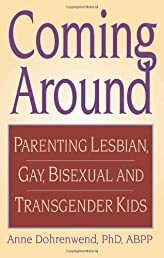 Coming Around is a resource for understanding and coming to terms with a child’s sexual orientation and maintaining a dialogue between parent and child. With compassion and wisdom, Dohrenwend addresses parents' fears regarding what to say and what not to say, bigotry and social and religious prejudice, the legal issues facing LGBT individuals and how to understand homophobia. Most important, she shares how to communicate that, whatever happens with a child's sexual or gender choice, parents will never withdraw their love. Coming out is a vulnerable time. Its announcement requires the re-exploration of a parent's personal feelings on homosexuality. Respecting your child’s decisions isn’t always easy, particularly if you fear his or her decisions will cost friends, ambitions, acceptance and respect. This is a rich resource, jam-packed with insights, information and practical guidance for parents of gay, bisexual and transgender children, as well as an indispensable reference for therapists, clergy, educators and psychological self-help collections.